Just got an email from Amazon with “A new book by Benjamin Franklin” in the Subject field. True,The Art of Virtueis not really a book by Franklin, more like a collection of his various moral pieces, but it’s strange to think of oneself as living in a society where the past is cancelled and a new book by Franklin is out today, and he’s supposed to get his share of the $9.99 readers will pay for the Kindle edition. It’s not just that Franklin is living and keeps on churning out a book now and then (“Released on December 12, 2011”), it’s also a golden opportunity to establish a sort of personal contact by helping him financially. I’ve received an email a couple of hours ago informing me that the Humble Indie Bundle 3 has been expanded now t0 cover the 5 games from No.2. At the website, after adding to my existing order, I saw a small table at the bottom showing the current break of the purchases per OS (3 are supported for all games, Win, MacOS and Linux). What is really amazing is that Linux buyers pay on average $11,67 (as of the time of writing this), which is about 4 times as much as an average Windows-based buyer ($3.88) and almost twice as much as a Mac user ($6.71). Sure there’s a possibility that some uber-rich benevolent dictator for life has filled the coffers of independent game makers (or tweaked the settings to send most of the payment to charity), but the fact still stands. My congratulations, bundle compilers. You’ve hit the right key. Flexible scheming of where your funds actually go, DRM-free distribution and cross-platform coverage open up the gate to the new venues of distribution – and I do not mean just games. You have found a way for like-minded people to support each other financially without the feeling of being ripped-off or let down somehow. And with Flattr, Kickstarter and other tools available, gift economy of social capital can finally start incorporating financial reward. A lot now depends on every purchaser, it is so thrilling to look what your money can do for social practices of the future. Go get the Bundle and let’s see how far the limits of the traditional distributions can be pushed. All which our ordinary students, right well perceiving in the universities, how unprofitable these poetical, mathematical, and philosophical studies are, how little respected, how few patrons; apply themselves in all haste to those three commodious professions of law, physic, and divinity, sharing themselves between them, rejecting these arts in the mean time, history, philosophy, philology, or lightly passing them over, as pleasant toys fitting only table-talk, and to furnish them with discourse. Love of learning, study in excess, with a digression, of the misery of scholars, and why the Muses are melancholy. And another quick thought – we must be standing now on the edge of the new breakthrough. Can’t wait to see what it will be this time. The fact that history and philology didn’t just plunge headlong last time does bring up some hopes for the future. just a short note for now. However there is a small group of sick people that has infiltrated in cities that are circulating drugs and money. Who prepared what? How to put it into whatever kind of practice? Which case is any case? A member of the Duma calls it “this infection”, like in Edwards’ Gangraena. Obviously there are societies where the metaphor of the “body politic” is not dead yet. It’s just once again the good old “many-headed monster” of the mob, strong but misguided, led by a cabal of ringleaders, deceived, mistaken, ultimately ready to fly back to the bosom of Power personified, who calls itself “brother” but acts as a father, giving orders to “those who love Muammar Gaddafi”. Libyan TV reports that the regime has been in talks with “the misguided youth”, who “have been handing over their weapons and joining the mass marches alongside the brother and leader of the revolution”. All is forgiven, Winston, come hug the brother leader. And then we will together “cleanse Libya house by house”. The same old “Strength Through Purity, Purity Through Faith”. The discourse of unity and “normality” is once again called up to help maintain the illusion of “order” and suppress what must be weakened and presented as isolated and small. If really so, why pay attention? Why maniacally persuade people that being united and clean is better than being dirty and disunited. How heavily will the new government of the new society rely on it, blocking the way to real development? How far back can this strategy be traced? And then, probably – when will this “retour a la normale” stop being resorted to in propaganda clashes? Clearing up the end-of-term backlog of articles, I have just found info on how the WikiLeaks app made by a Russian programmer for the iPhone (what a strange idea, actually) was promptly banned by the corporation of glamor. More of it here. The second says “apps must comply with all legal requirements in any location where they are made available to users”. Well, the second one is really eyewash, given that in every country newspapers legally republish the cables. As for the first one – who is actually offended or defamed? I would very much like to see a WikiLeaks page on Apple one day. It seems we have a lot to learn in this direction. I won’t even compare iPhone with Android here (go to the Market and see for yourself). I’ll just tell how I got back to the December article. Today on BBC Technology there appeared quite a tongue-in-cheek article on the Confession app for the iPhone (same price of $1.99 as for the WikiLeaks app). Sorry, BBC, but I can’t resist the temptation just to give the link to the screenshot on your site. Well, I must say it grossly offends my feelings as an athei. No, it doesn’t. I find that lame excuse in the shape of an admissions policy hypocritical and unfounded. How about the countries where Christianity is unwelcome? Doesn’t it actually violate the local law? As a side note, Foucault would surely have loved this. An interiorized confession manual, fully owned by the sinner and privately stored on the phone. Does one actually need a confessor if you can just tick the correct boxes? 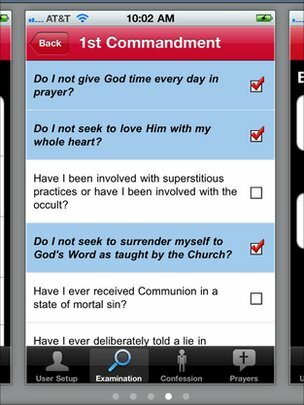 My call is for the companion penitential app, of course. On a serious note, applications you personally do not like look OK in the public if nothing’s banned. But if the banhammer is let loose at will, the Big Brother just has to twist and turn in the eyes of the public, like a twisty-turny thing, to borrow a phrase from Blackadder. OK, an update. Can’t hide from you the fact that at the Android Market there’s a number of WikiLeaks apps. But the thing is, all of them say 100% of the money will be donated to support Assange and Wikileaks (not just 50%, heh). It may be true, at least I hope so. In some cases it may really be a marketing ploy using the openness of Android. But whatever the intention, freedom of information raises awareness. The app works, and you can read the cables, and in some apps even choose a mirror source. What if Apple controlled the browser or the internet as they do their store? Would we even have known about WikiLeaks? “[Apple] said there is no way back for this application,” Mr Barinov told BBC News. Forgive me for being melodramatic, but I kinda sensed a shadow of the infamous boot on the human face, applied rather selectively. Welcome to the dystopia world of the twisty-turny thing. Because Apple is so 1984.